Jean Speedie, the day after her 100th birthday. 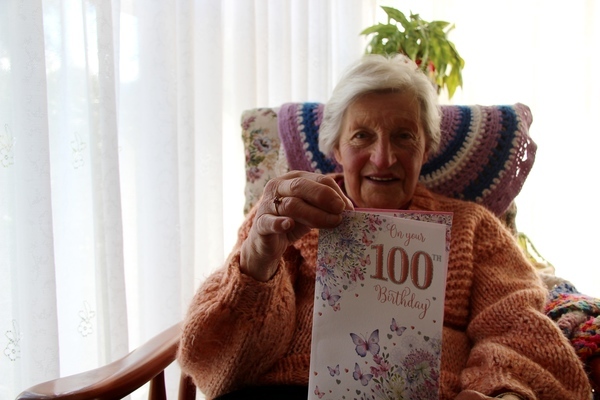 Tecoma great-great grandmother Jean Speedie celebrated her 100th birthday on Tuesday 4 September. She puts her longevity down to walking. “I’m lucky that I can walk without a walking stick,” she said. “My old legs are getting weaker now, though. Jean said the milestone felt no different. “It’s just another year,” she said. Friends and family stopped by her home on the special day with cards and gifts, and Essendon Football Club legend Ken Fletcher paid a special visit to the life-long Bombers fan. About 60 friends and family joined Jean for lunch at Rose Cottage Restaurant in Monbulk on Saturday 8 September. “I grew up right opposite Sherbrooke Forest,” Jean said. That’s Anderson Road. She was brought up on a 10-acre property there, the youngest of 10 children. “I came along when mum was 42,” she said. Jean was born at Yarraville. Her mum was staying there with an aunt. “She’d just heard my brothers were killed in the war,” she said. Two of Jean’s sisters died from illness as infants. 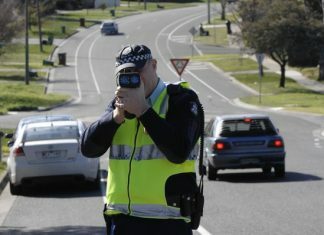 “The nearest doctor was in Ringwood. If you didn’t have a horse and cart you couldn’t get there,” Jean said. Her late husband, Owen Stanley, lived only about a mile from her childhood home. “I met him in Sandells Road,” Jean said. “I used to walk home with his sister Enid from school. “Mary, my sister, was the eldest. I had a nephew older than me – 17 months older – Harry. “Harry got friendly with Owen and he used to bring him up to our place. There wasn’t much work in the area during the 1930s, so Owen went to New Guinea in 1936. She followed him there “a good while after – I was only 20″. He worked on a rubber plantation. “The Speedie family was well-known in Port Moresby,” Jean’s son Ralph explained. Owen Stanley was named after the Owen Stanley Ranges in New Guinea, but was born in Wandin. He married Jean on 16 July 1938. They lived in Hughes Street – now Hakea Street – for 21 years before moving to Frame Avenue. “The road wasn’t made here,” she said. She’s now spent 51 years there. “The backyard falls away but it’s nice,” she said. “I look out the front and I can see one tree hill. 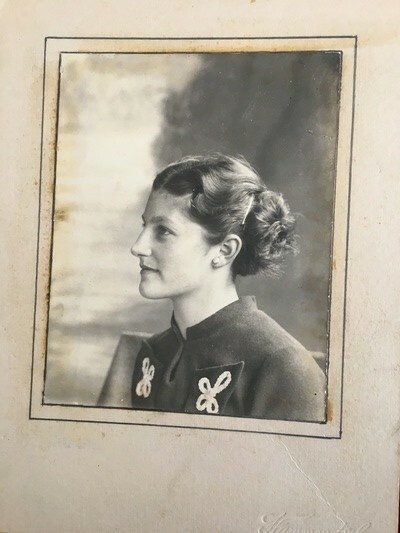 Jean reminisced about catching Puffing Billy to Upper Ferntree Gully for a train to the city, and being at the opening for Belgrave’s Cameo Theatre in 1935, aged 17. “I’ve been there many times since,” she said. She said the Soldiers Memorial Hall, opposite where Woolworths Belgrave stands today, screened films before the Cameo opened. “There was a garage next door. They used to have movies in the garage before the memorial hall was built after the war,” she said. 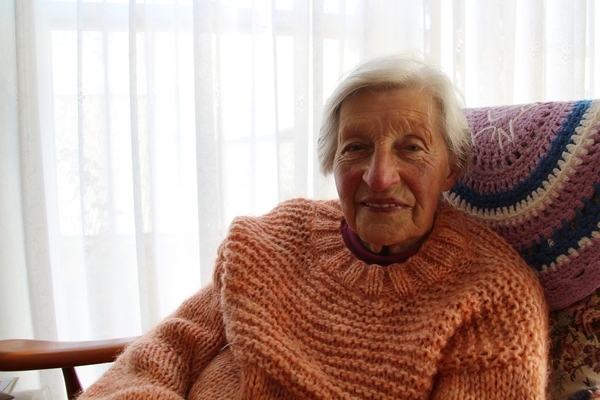 Jean has six children, 16 grandchildren, 28 great-grandchildren and two great-great grandchildren. She still lives on her own and does her own cleaning and cooking, but accepts some help with her garden.